Acceleration- The rate of change in velocity with respect to time. According to Newton's second law of motion, acceleration is equal to the force, divided by mass (A=F/M). Accelerator pump- Accelerator pumps are found in cars equipped with carburetors. When you accelerate, the accelerator pump delivers extra fuel through the accelerator pump circuit to allow the engine to deliver more power. Actuator- An electrical mechanism for moving or controlling something indirectly instead of by hand, such as a door lock. Output device the PCM controls such as solenoids, relays, fuel injectors and stepper motors. AE - Acceleration Enrichment, the enriched mixture provided when the throttle position sensor signal changes at various rates. AFR - Air Fuel Ratio, the mass ratio of air to fuel in the combustion chamber. See NB- and WB-EGO sensors, below. Air filter- This device filters the air that goes into your engine. Without an air filter, harmful particles would enter your car's engine and cause internal wear and damage. Air pump - Many emissions systems include an air pump, which pumps fresh air into a vehicle's exhaust to help complete the combustion process and reduce emissions. To get accurate lambda measurements with the LM-1, air pumps should be temporarily disabled. ASE - After Start Enrichment, the enriched mixture provided for a number of engine cycles when an ECU detects that the engine has transitioned from cranking to running. Carburetor - A mechanism which mixes fuel with air in the proper proportions to provide a desired power output from a spark-ignition internal combustion engine. Carburetor jet - A fitting inside a carburetor that meters fuel into a metering circuit where it is mixed with air. Catalyst - A substance that can increase or decrease the rate of a chemical reaction between substances without being physically consumed in the process. A catalyst, which reduces engine emissions, is used in a catalytic converter. Catalytic converter - An in-line, exhaust system device, containing a catalyst, which reduces engine exhaust emissions. Converters are located near the exhaust manifolds or headers for maximum efficiency. Closed loop - refers to those times when an EFI computer is using the feedback on the mixture provided by the oxygen sensor to effectively control the injected amounts. Combustion - The process by which the air/fuel mixture burns within an engine to create power. Computer (PCM) - Many modern cars have a central computer called an engine control unit (ECU) or power train control module (PCM). This controls the car's fuel and ignition systems by taking information from various sensors to determine how to run the engine with the most efficiency and power. Converter (Torque) - A fluid coupling device which multiplies torque between an engine and automatic transmission/transaxle. When a vehicle is stopped, a converter allows enough fluid slippage, so the engine can idle without stalling. CTS - Coolant Temperature Sensor. Usually the CTS is an NTC (Negative Temperature Coefficient) thermistor, or a resistor whose resistance varies with temperature (NTC means the resistance goes down as the temperature goes up. DMM (digital multi meter) electronic current/resistance/potential measuring tool. Double overhead cam (DOHC) - A DOHC engine has two camshafts in the cylinder head - one for the exhaust valves, and one for the intake valves. This allows greater efficiency and greater power. Driveline - The system of components that connects the transmission to the wheels. The driveline consists of axles, differentials, constant velocity (CV) or universal joints, and a driveshaft. Driver - A switched electronic device housed in a computer that controls output state. For example, a driver controls how long a fuel injector remains open. Duty Cycle (DC)– A number indicating the amount of time that some signal is at full power. In the context of an ECU, duty cycle is used to describe the amount of time that the injectors are on, and to describe the “hold” part of the peak and hold injector drivers (see Low Impedance Injectors, below). Early Fuel Evaporation - Used on carburetor-equipped engines only, a system where heat is used to help increase early fuel evaporation of the cold-start air/fuel mixture to achieve more efficient combustion and lower emissions. GM used an electric grid system. EGO Sensor - Exhaust Gas Oxygen sensor, used to describe the sensor in the exhaust that measures the lean/rich state of the AFR. Used to control the via a feedback algorithm called “closed loop”. Emissions - Emissions are the byproducts of combustion. After combustion is complete, water, gases, and carbon are released through the car's exhaust system as emissions. Emissions equipment - Emissions equipment is equipment required by the government to keep a car's exhaust emissions to a minimum. Emissions equipment includes catalytic converter, air pump, and oxygen sensor. Engine - A machine designed to convert thermal energy into mechanical energy to produce force or motion. Connected to a drivetrain, an engine's mechanical energy, or torque, moves a vehicle. An engine can run by using gas, diesel fuel, steam or other fuel sources. Engine accessory - An engine accessory is a peripheral piece of equipment that runs directly off of the engine's power to supply energy or a fluid to another part of the car. Engine accessories include the alternator, power steering pump, air pump, air conditioning compressor, as well as many others. Engine block - The engine block is where the cylinders and pistons reside. The block is the strongest part of the engine and withstands tremendous pressures while the engine is operating. Engine temperature sender - The engine temperature switch and sending unit measure the temperature of the engine's coolant. They send this information to the engine temperature warning light and engine temperature gauge, respectively. Compare to coolant temperature sensor (CTS) which transmits the coolant temperature to the computer, and the radiator fan switch which engages the radiator's cooling fan. Fuel injection - Fuel injection is a system by which fuel is directly sprayed into the intake manifold or intake port at high pressure. 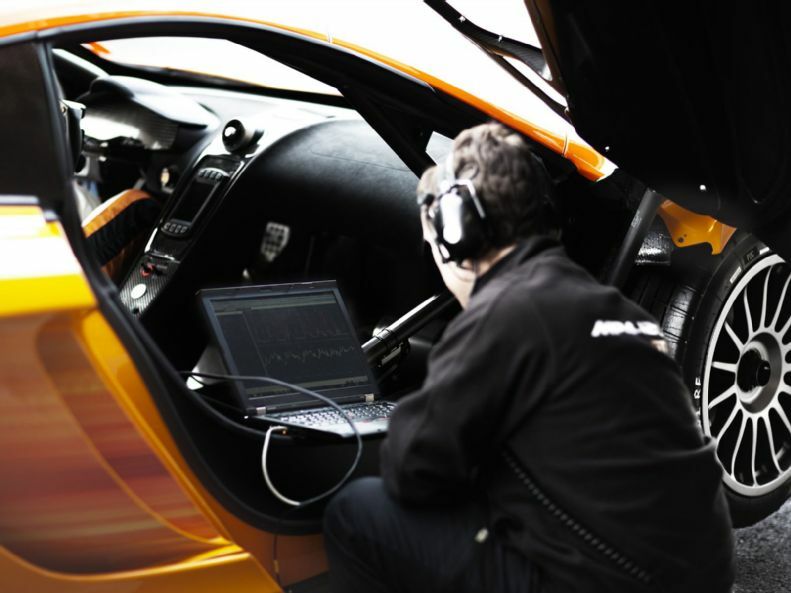 Fuel injection is often controlled by a computer, allowing precise monitoring of efficiency and performance by the car's computer. Fuel injector - A device for delivering metered, pressurized fuel to the intake system or individual cylinders. An injector sprays fuel, which helps atomization for a more dense mixture, when combined with incoming air. Fuel pump - The fuel pump moves gas from the gas tank and delivers it to the fuel injection system or carburetor. Fuel starvation - Fuel starvation occurs when fuel, for one reason or another, is prevented from reaching the carburetor or fuel injectors. Fuel system - The fuel system is the system by which fuel is stored and delivered to each cylinder. The fuel system includes the fuel tank, fuel tank level sending unit, the fuel pump, the fuel filter, and fuel lines. For carbureted cars, the fuel system also includes the carburetor. For fuel injected cars, the fuel system also includes injectors, fuel pressure regulator and often a main computer. G-Force - Unit of measurement used to describe lateral acceleration generated while the vehicle is driven in a steady state turn on a skid pad circle. An average sedan generates 0.60 G of lateral acceleration. Measured in "gravities", one G equals the earth's gravity at sea level. Ground - An electrical conductor used as a common return for completing an electric circuit(s). Car batteries contain a ground terminal, usually the negative terminal. Head gasket - The head gasket seals the cylinder head to the engine block. It is subject to tremendous pressures, and often fails if and when an engine overheats. Headers - Constructed from steel tubing, headers provide a smooth and efficient exhaust flow path from the exhaust port to the exhaust system. Headers are frequently used in performance engine applications and are generally less restrictive than the stock exhaust manifold, resulting in increased power. High Impedance Injectors - (a.k.a. hi-Z) Fuel injectors designed to work with a simple switch in a 12 volt circuit, no special signal conditioning is required to drive them. The resistance of a high impedance injector is about 10-15 ohms. IAC – Idle Air Control. Typically a “stepper motor”. IAT sensor - Intake Air Temperature sensor, same as MAT, see below. Idle circuit - This is a special kind of circuit found in a carburetor that only operates when the engine is at an idle. Ignition - Complete system used to step up battery voltage to a higher voltage and deliver it to the spark plug to complete the combustion process. When the key is turned on, the ignition system is energized. Ignition Advance/Retard - The advancing or retarding (in crank degrees) of ignition spark relative to the piston location in the cylinder. In performance applications, the goal is to set ignition timing such that peak cylinder pressure occurs at 16-18 degrees after top dead center (TDC). Ignition module - Part of the ignition system which instructs the ignition coil to send current to the distributor. Ignition system - The ignition system contains the components that supply spark to the vehicle's spark plugs. These include the battery, the ignition coil, the distributor (including the cap and rotor), the spark plug wires, the ignition module, and the spark plugs themselves. Older cars also have ignition points and an ignition condenser. Knock (Engine) - The sharp, metallic sound produced when two pressure, or flame fronts collide in the combustion chamber. This could be the result of incorrect ignition timing, incorrect air/fuel mixtures, or the wrong grade (octane rating) of gas. Also known as Detonation. kPa (kiloPascals) - the measurement of air pressure used in some ECU computations. Average pressure at sea level is 101.3 kPa. Low Impedance Injectors - (a.k.a low-Z) Fuel injectors that are designed to run at a much lower current than would be supplied by a direct 12 volt connection. They require a special signal that is initially at full current (4-6 amps, a.k.a. “peak current”) for about 1.0-1.5 ms, but then drops down to about 1 amp (“hold current”) for the rest of the opening pulse. The resistance of a low-impedance injector is typically 1-3 ohms. MAP sensor - Manifold Absolute Pressure sensor. Measure the absolute pressure in the intake manifold (related to the engine vacuum), to determine the load on the engine and the consequent fueling requirements. MAT Sensor - Manifold Air Temperature sensor, the same as IAT. The MAT circuit is identical to the CTS circuit, see CTS, above. NB-EGO Sensor - Narrow Band EGO sensor, gives a switch at the stoichiometric ratio (the chemically correct mixture of air and fuel), but unreliable for AFR other than stoichiometric. OEM (original equipment manufacturer) - refers to parts produced for initial assembly of a new vehicle. Open Loop - refers to those times when ECU ignores the feedback from the oxygen sensor. P&H Injectors - Peak and hold injectors; see Low Impedance injectors. Pulse Width Modulation (PWM) - A signal with a fixed pulse width (frequency), which is turned on for part of the pulse. The percent of time that the signal is on is called its duty cycle. PWM is used to control voltage (and consequently current) to fuel injectors. Stoichiometric Ratio- The ratio at which all available fuel is combined with oxygen during the combustion process. This theoretically ideal ratio produces minimum emissions, however maximum power is achieved at an AFR 10-15% richer than stoichiometric, while maximum efficiency is achieved at an AFR 3-5% leaner than stoichiometric (depending on many engine variables). TPS - Throttle Position Sensor, a voltage divider that provides information about throttle opening, from which it computes rate of throttle opening for acceleration enrichment. VE - Volumetric Efficiency. The actual amount of air being pumped by the engine as compared to its theoretical maximum. A 200 cubic inch motor will theoretically move 200 cubic inches of air in one cycle at 100% efficiency. If the engine is actually running at 75% VE, then it will move 150 cubic inches of air on each cycle. WB-EGO Sensor - Wide Band EGO sensor, can be used to derive real AFR data with mixtures from 10:1 to 20:1, i.e. anything you are likely to be interested in. WOT - Wide open throttle. WUE - Warm Up Enrichment, the enriched mixture applied when the coolant temperature is low.